"Predicting what the bulk 'homogenized' properties will be has been very hard to determine until now," said Mike Fiddy, a program manager in the Defense Advanced Research Projects Agency, or DARPA, which funded the software's development. "We cannot possibly solve this problem by trial and error," said El-Kady, who conceived Mirage. "Instead, we could do the opposite. We could say: 'Here is the behavior I want. Now tell me what the metamaterial looks like.'" No tool used this inverse-design approach. So, El-Kady and his team at Sandia's National Security Photonics Center built one. Mirage lets users start by telling it the optical property they want—how their metamaterial needs to interact with light—and their starting materials. Mirage generates designs that match those criteria from a library of more than 100 templates. Or, users can draw their own designs, and the program will check them for errors. 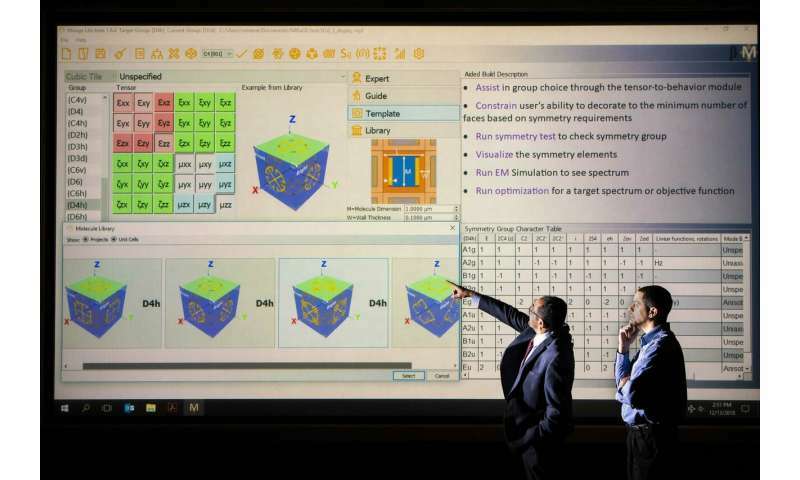 "A more systematic approach for designing metamaterials should greatly accelerate their adoption in various application areas," eliminating more commonly used, intuition-based approaches, Fiddy said. DARPA featured Mirage as a premier technology at the agency's 60th Anniversary Symposium in Fort Washington, Maryland, showcasing its far-reaching uses. "Mirage is an all-in-one tool," El-Kady said. "Not only does it tell you what the metamaterial looks like, it allows you to explore various configurations, simulate the system, validate the chosen behavior, visualize its response and optimize its functionality within your fabrication constraints." Brener's team previously created a material that can mix two lasers to produce 11 colors at once, including infrared and ultraviolet light. Potentially, this technology could be developed into tunable lasers that replace single-color ones. But some of those colors are too dim to be useful, so he's exploring ways to brighten the output. Other software packages Brener has used include simple optimization algorithms. However, to use more advanced algorithms he must supplement those packages with his own coding. Not so with Mirage. "Optimization techniques come in many different flavors," he said. "Mirage is the only software package I know of that has the complex optimization techniques I need built in."